Hint: It’s the happiest place on earth!! Did you figure it out? Disneyland! We love Disneyland! We made a very short, whirlwind trip for our vacation. My girls are older, so we don’t have to worry about going on every ride, or taking naps (although I could have used one! ), or how long the lines are. Each daughter took a friend, but we all hung out together. We had great weather and a great time! I have a few websites that are my go-to place to get good tips. LIke I said, my kids are older, so some of it doesn’t apply. But since we have gone so often during the years, we are always looking for new and different things to do while we are there. http://www.disneytouristblog.com/disneyland-60th-anniversary-diamond-celebration-guide-tips/-tons of information on all the Disney parks and the pictures are incredible! 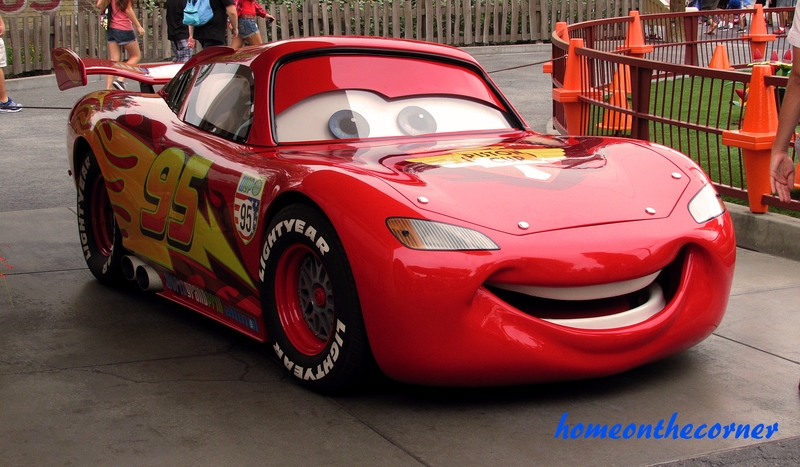 http://www.yourmodernfamily.com/never-seen-tips-disney-kids/-Just found this one, but she has some good tips too, especially what to do when the park get busy! 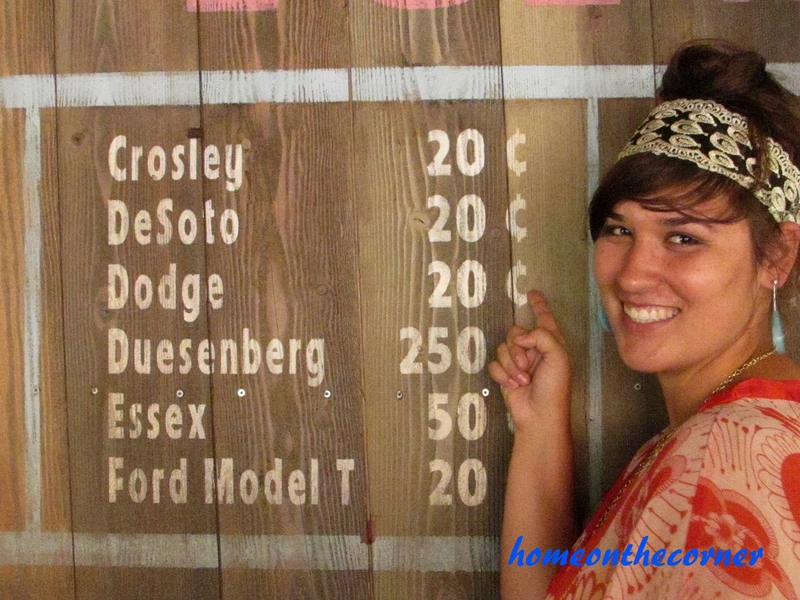 http://funcheaporfree.com/2015/03/disneyland-on-the-cheap-part-1/ So. Much. Information! She covers everything!!! It’s pretty awesome. This is one to definitely check out, especially if you are going with small children. Did you know there is a Disney Nanny?! We left very, very early (like 3:30 am!) in the morning in order to get to Ca. Adventure right around opening time. 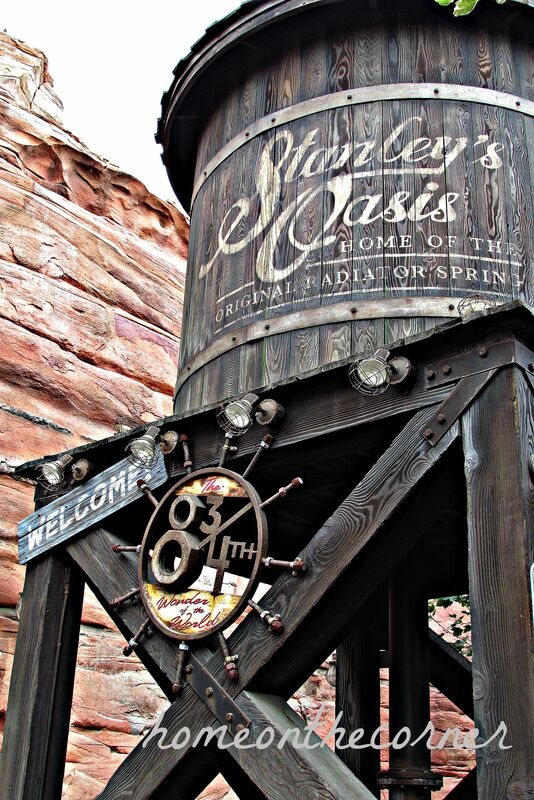 We were determined to get on the Radiator Springs Racers without having to wait too long. While my husband and I rented a locker, the girls ran to the Fastpass line and then we all met at the ride. We still had a bit of a wait, but 45 min. is nothing compared to the line later in the day. We also scored Fastpasses so we could ride a second time! There are lots of fun and interesting things to see while waiting in line too (besides people watching!). There are also Hidden Mickeys around. Look for one in the plants in the que line. I wish changing the oil would only cost $.20! 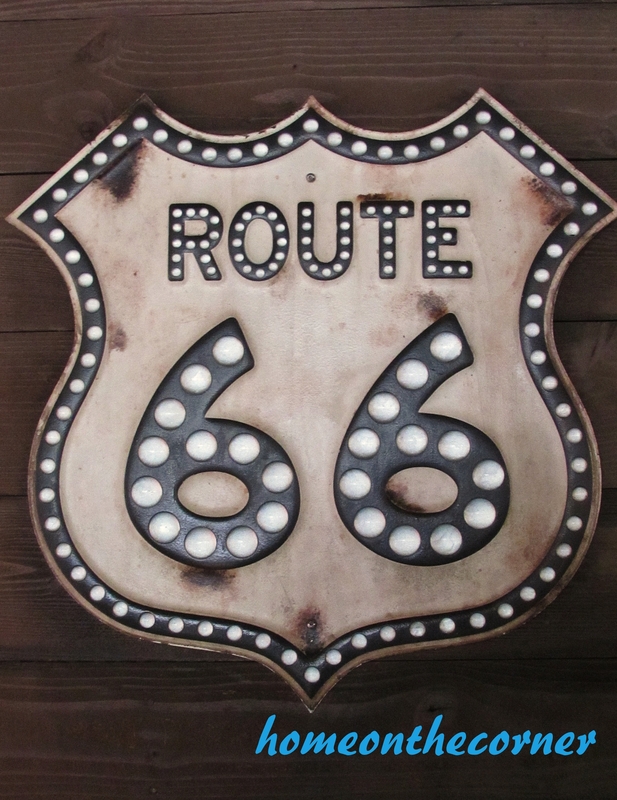 Did you know that Route 66 runs through these states and in this order? We did have some issues with rides breaking down during the day, but they did all eventually start running again. 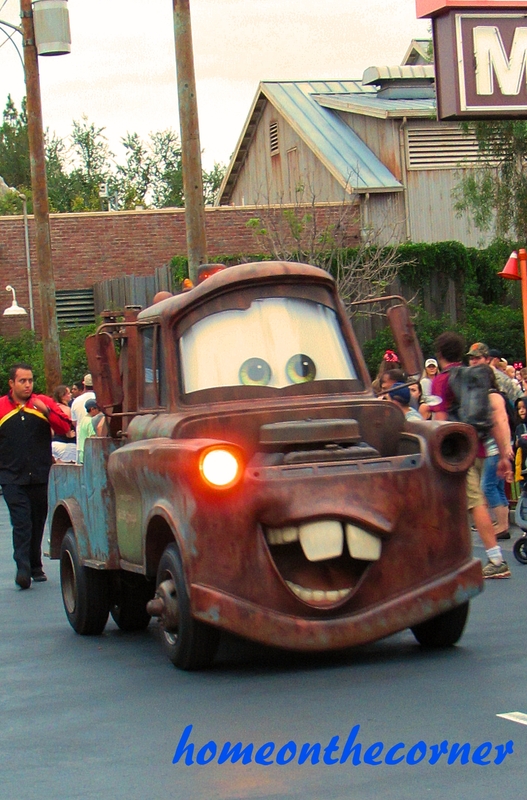 Disney will accept Fastpasses anytime during the day if the ride has broken down. 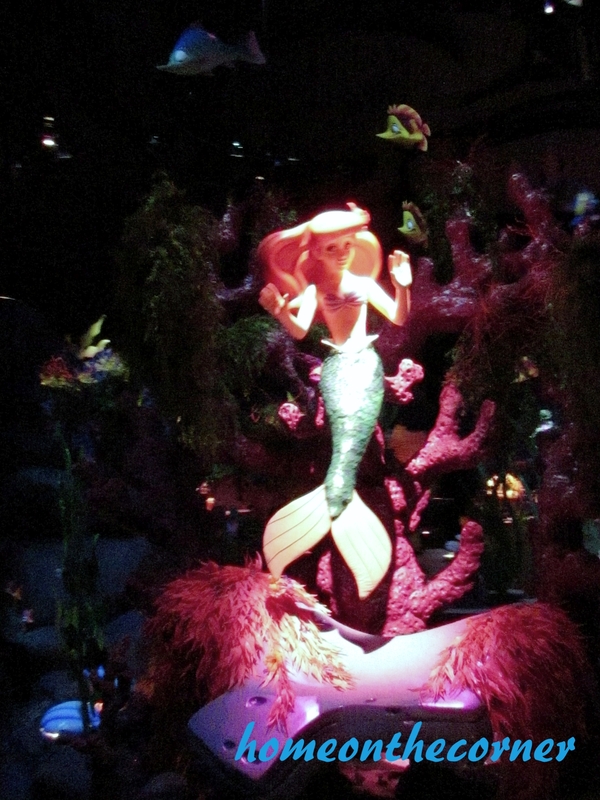 After Radiator Springs Racers we went to Ariel’s Undersea Adventure. Even though the girls and I had seen it before, my husband and the other girls had not. I did take a few pictures, but most were blurry. I was trying to figure out the best settings to take pictures in the dark rides. 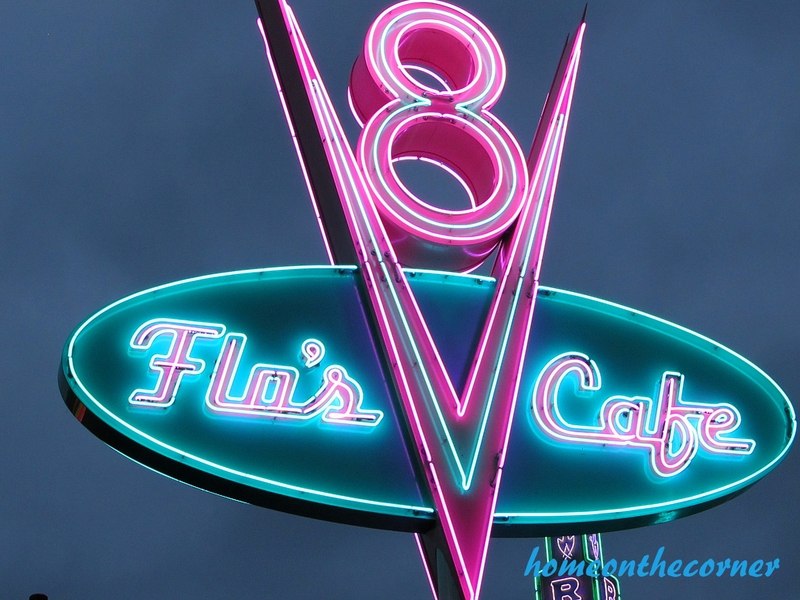 TheTouristDisneyBlog has lots of great tips for photography. We ended up riding R.S. Racers again with our Fastpass before we even could get on another ride. 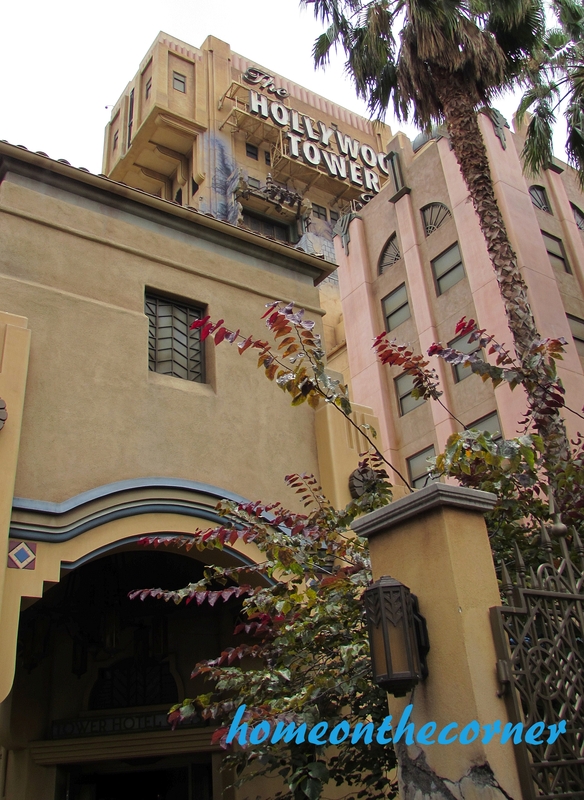 We spent some time on Hollywood Lane, while waiting to see if Tower of Terror would reopen. We love going into Off the Page and playing around with the different stations. 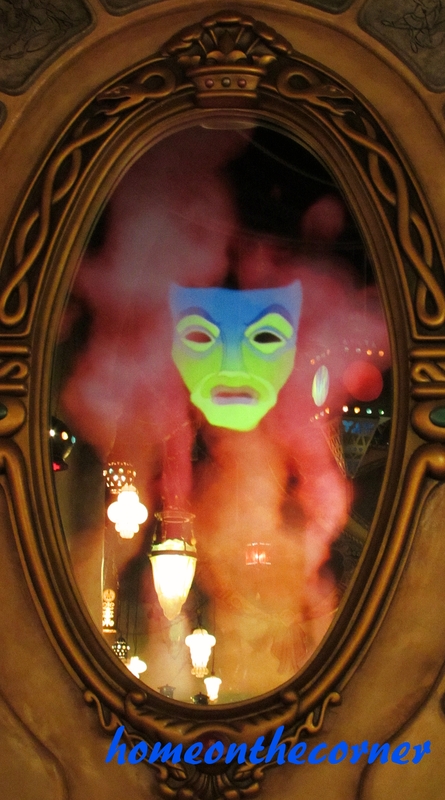 I liked the look of the lamps in the reflection of the Magic Mirror. 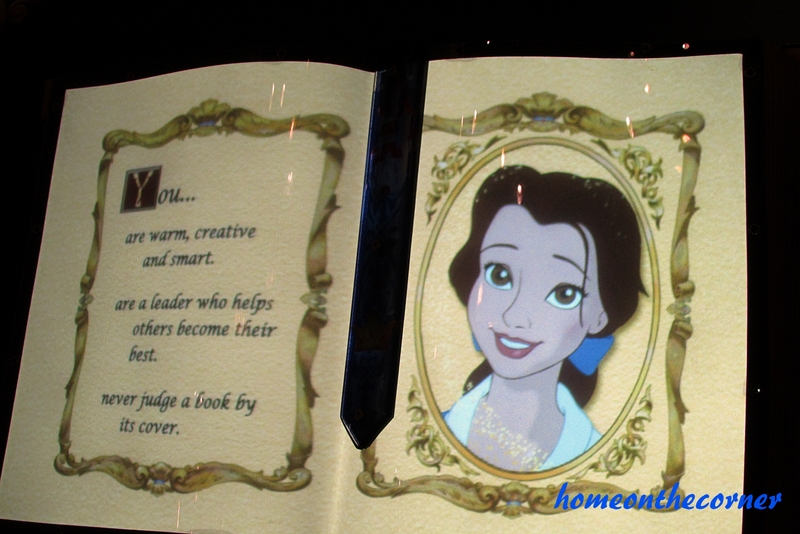 There is also the Beast’s Library where you have your picture taken, answer specific questions and the book will tell you which character you are most like. Haley’s friend got Belle. After having some lunch, we headed back to Tower of Terror and waited in line. It went pretty quickly and the ride is definitely worth the wait! 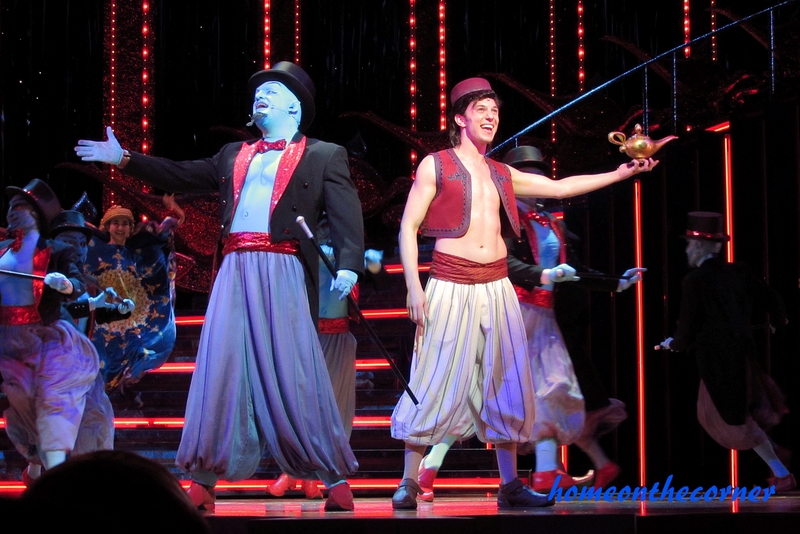 Right next to Tower of Terror is the Hyperion Theater which has the most amazing Aladdin Show. We have seen it many times, but it never ceases to amaze. The Genie is absolutely hilarious!! He is the reason we keep coming back! Look for the Hidden Mickeys here too! 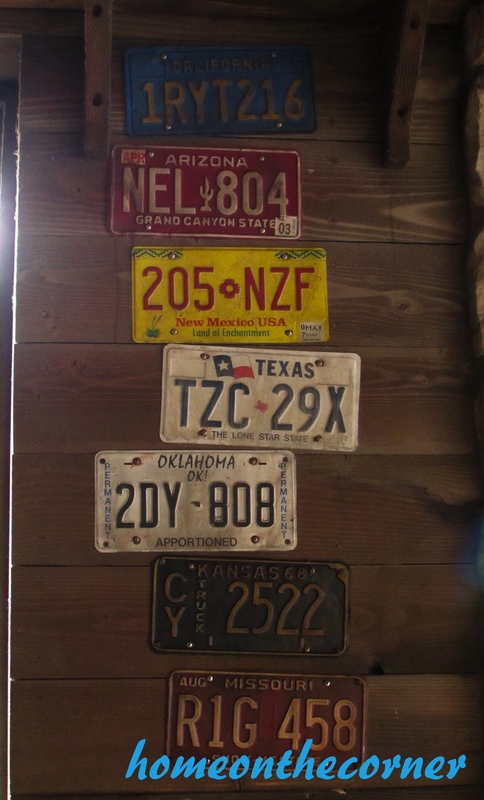 If you haven’t seen it before, make sure it is one of your stops next time! We also rode on Soarin’ Over California, which, in my opinion, is the best ride ever! I love it! We even got Fastpasses so we could ride again at the end of the night. We rode Toy Story Mania which is like a shooting gallery. None of us had been on this one, so it was a lot of fun. I actually did pretty good, compared to the laser kind, like Buzz Lightyear. I’m awful at that one!! After dinner at the Wharf, we headed back to Radiator Springs to watch the Sh’Boom. Don’t know what that is? Neither did I, until I read these great blogs above! You know how in the movie, the lights slowly go on, at each store, all the way up the street? Well, that’s what they do here too! It was very cool! When the lights come on, you really feel like you are in the movie set! Another thing to look for-go to the Cozy Cone Office. Look through the back window and find Buzz Lightyear! We headed back to the center area of Ca. Adventure to watch World of Color. 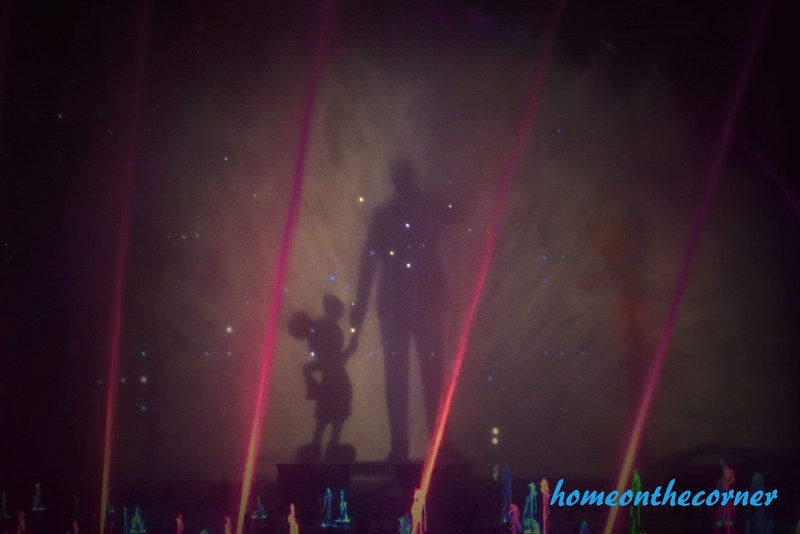 The show is a water show where different scenes from movies are projected onto the water. It’s pretty hard to get pictures, plus we were kind of close, and the camara kept getting wet. I like the show, but I don’t like the standing. After being on your feet all day, it is really hard to stand. The show was good though. It honored Walt Disney and everything he accomplished. It showed a lot of the history and quite a few of the old movies. After riding Soarin’ Over California one more time, we finished off our first day. We were pretty exhausted since we had been up so early. We were ready for some sleep before tackling Disneyland the next day! 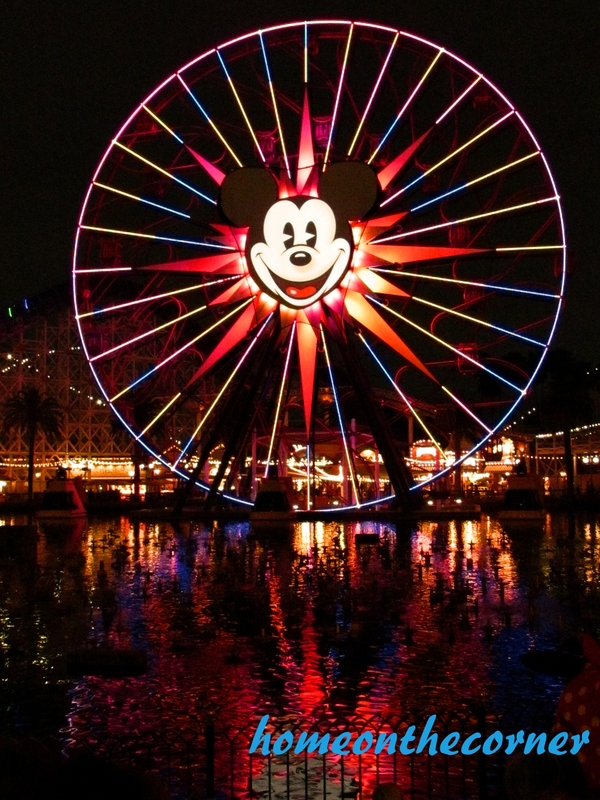 What’s your favorite part of California Adventure or what would you do first if you could go? Stay tuned for Part 2: Disneyland, next week! We love going to Disneyland! My favorite part of your posts were all the little extras to look for and do! You had some great ideas! 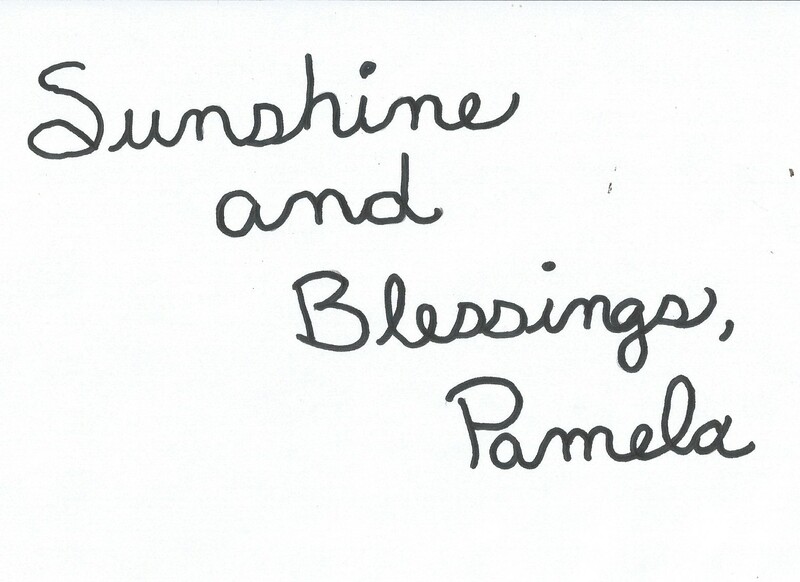 Thanks for sharing at Waiting on…Wednesday! Hope to see you back tomorrow! I will be back! Thanks for the sweet comment! We really want to go to Disneyland next year! Your pictures make me so excited to plan our trip. 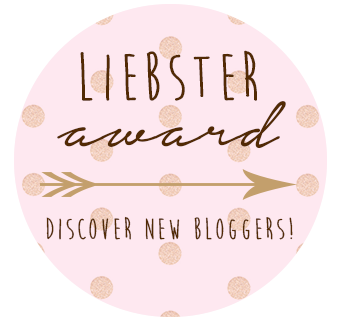 Thanks for linking up at the Bloggers Brags party, I pinned your post to our group board. 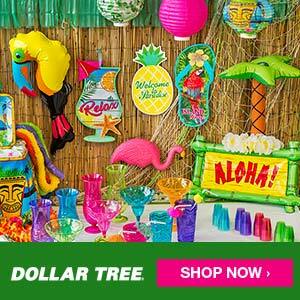 You will have so much fun! It is the Happiest Place on Earth, right! 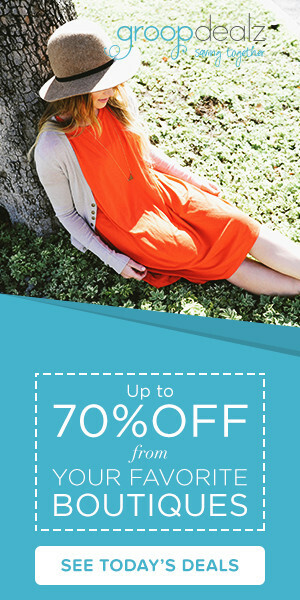 Just do some planning, and your time will be much more pleasant! Have fun! Sounds like a wonderful trip! My husband suggested this morning that the kids and I come along on his business trip next month out to CA and go to Disneyland. I’m thinking about it, but will probably wait until the kids are a little older. Thanks for sharing at What’d You Do This Weekend?! Definitely do it at some time! Take advantage of that business trip!! We have many great memories. That is really the what make is so special! We visited Disney World earlier this summer. I love seeing how two such similar places have such distinct personalities at the same time!